The words "modern" and "China" are not frequently associated. Times are changing. Steam engines are being replaced by modern high speed electric trains. Southern China is packed with high-tech industry. Cheap labor is in abundance. Transit is needed to move the workers, and the Chinese government is aware of that. Hong Kong has perhaps the best transit system of any city in the world. Here are a few photos from that region. Riding the Hong Kong MTR late at night. During rush hour, people are crammed in like sardines as the system carries 2.2 million passengers daily. An old diesel heads north to Guangzhou (Canton) on the KCR (Kowloon-Canton Railway) in mainland China. They weren't happy about my camera and prevented me from taking pictures in the station in Canton. This is probably the busiest double-track railroad in the world, handling freight business to and from Hong Kong, through passenger trains and commuter trains that carry over 800,000 passengers a day! A modern MTR subway train arrives in Tsim Sha Tsui, Kowloon, Hong Kong. It was no surprise. Train arrivals are displayed on boards that indicate the destination and time until the next train arrives. Over 2.2 million passengers ride the system each day. Inside an MTR train late at night. There are no vestibule doors, only end doors opposite ends of the train. Most people stand on the train. They are air-conditioned and comfortable and have animated signs that show your location and destination and which side the doors will open. Signs on the platform indicate when the next train will arrive. 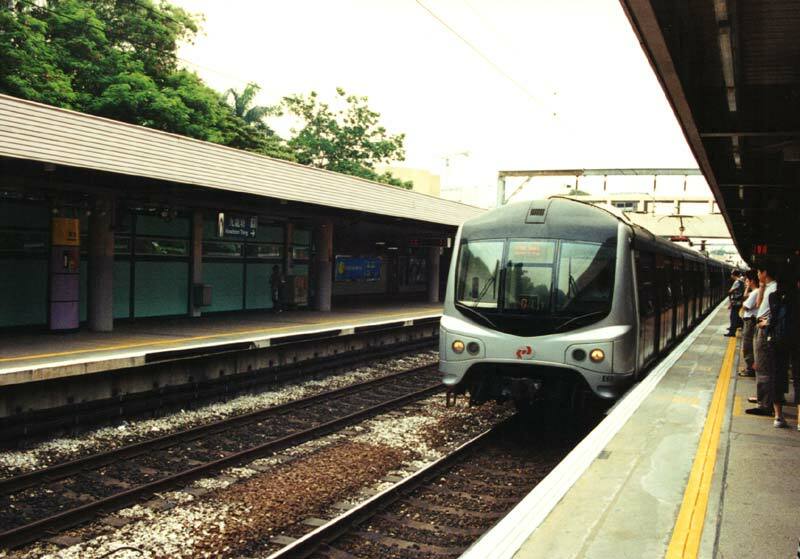 A northbound KCR train arrives at Kowloon Tong, the Hong Kong equivalent of 125st. There are no subway stations at the southern terminal of Hung Hom in Kowloon, but you can ride a Star Ferry from there to Hong Kong, or catch a bus. Because of the subway connection, Kowloon Tong is a very busy station. Just like cars in Hong Kong, traffic runs left-handed on the rails. 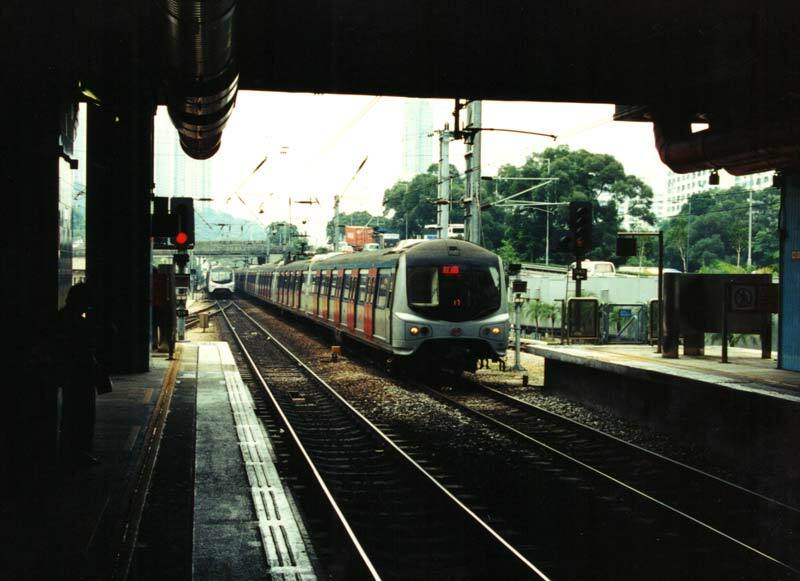 Commuter trains arrive and depart Sha Tin simultaneously. This happens frequently as commuter service is provided at 3 minute intervals during rush hour. That's how they carry 800,000 passengers on a two track line. The most common cause for delay is suicides. With the poor economy in Asia, it happens more frequently than they would like. 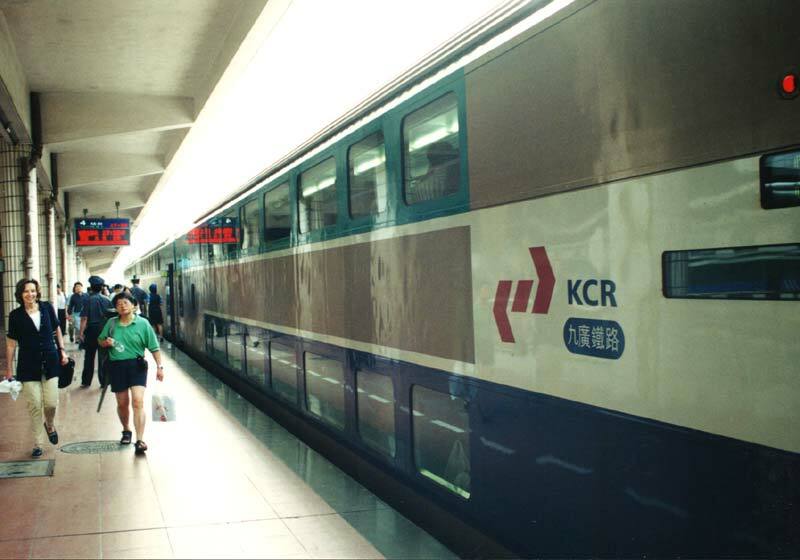 A modern bi-level car on the Canton-Kowloon Express. This train operated at speeds in excess of 100 mph and provided business-class seating on the upper deck. When I attempted to get a picture of the front of the train, I was stopped by a customs agent who checked my passport and directed me to board the train. I didn't argue, he had a gun. 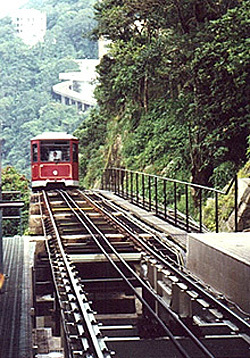 The Peak Tram is one of the steepest rail lines in the world. It climbs Victoria Peak from Central Hong Kong. Because the grade differs on the trip, the seats are level. When the climb is steep, you are pinned against your seat. During rush hours, the tram makes intermediate stops on The Peak for wealthy residents who live on some of the most expensive real estate in the world. Photo courtesy of The Virtual Tourist. No it's not a train, but it carries many passengers. 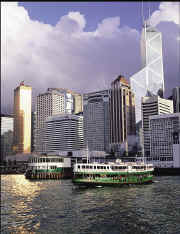 The Star Ferry operates between Kowloon and Hong Kong Island with almost continuous departures. It costs $1.7 HK, or about 23 cents to ride the lower deck, or $2.2 HK on the upper deck (about 28 cents US). It's the best bargain in the world. 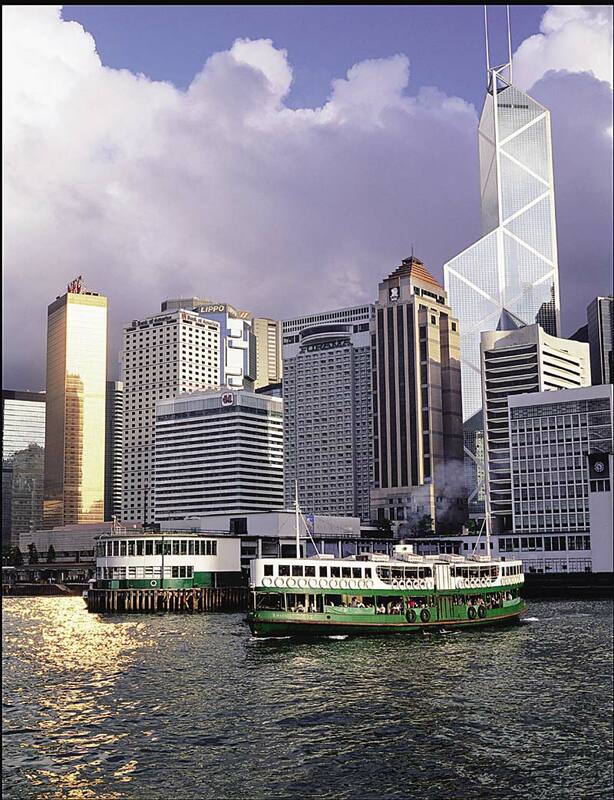 Photo is courtesy of the Hong Kong Tourist Association.